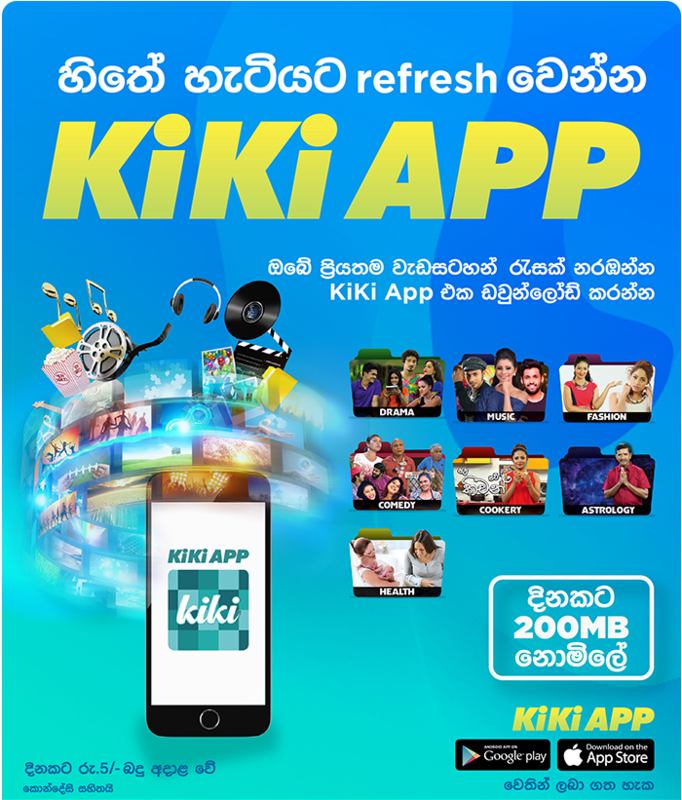 Kiki mobile app is a streaming service that offers exclusive Sinhala Video on Demand content on a variety of genres such as dramas, comedy, cookery, religious and music and many more. Kiki app offers exclusive Sinhala video content which will be available only on KiKi. How do I download KiKi? You could download KiKi app via PlayStore & App Store. What should I possess to view KiKi? An android device that runs OS 4.4 kitkat or later. Apple device that runs OS 11.0 or later. Can I view KiKi from anywhere? Yes. As long as you have a subscription and an active high-speed internet connection you can enjoy KiKi from where ever you are. How much do I have to pay to watch Kiki videos? How will I know when I need to renew my subscription? I already have the KiKi app installed, but I cannot watch content. Go to Google play store or App Store and check whether you are running the latest version of KiKi app. If your phone is slow, restart your device and run the app. Will I have to pay data charges in addition to the subscription? Yes, you will receive 200 MB FREE per month & standard data charges will apply for extra usage. Can I fast forward and rewind the content? Yes. Click on the arrow shaped forward or back buttons which are on either side of the play button. What does ticking the “subscribe” button do? If you tick the subscribe button on content that you are especially interested in, any new content for that particular program will show up in your Subscribed section. This makes it easier for you to find. Can I leave comments on the videos? How do I find my favorite episode? Click on the category icon. Then, next to the program which you want, there will be a button that says “episodes”. Once you click on that button, you will get a list of all available episodes for that program. Play your favorite song for your callers! With mTunes, you can select a song that will play instead of the standard ringing tone. 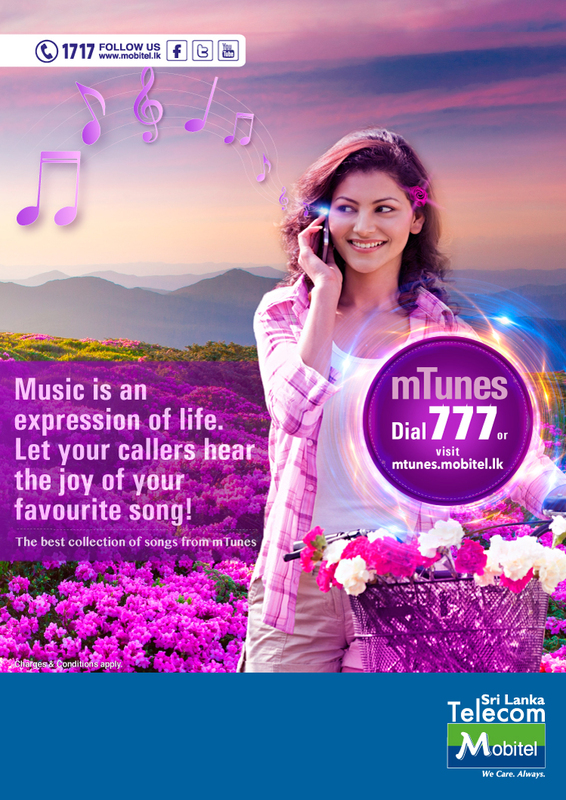 To subscribe to mTunes, dial 777 (Call charges: Rs. 2 per minute + taxes). Songs: Mobitel music is geared with the biggest song data base in the industry, which spreads across all languages from 1960s hit songs to present chart toppers. To listen, dial 555 (Call charges: Rs. 1 per min + taxes). Ringtones (Mobitel SIM Menu/WAP): Impress your friends by playing your favorite song as your mobile ringtone. Choose and download from our wide collection of songs at wap.mobitel.lk. Collection of songs at wap.mobitel.lk. Music videos: To watch the newest music videos on your mobile, just make a video call to 555. Charges: Rs. 3.00 per min + taxes. Star portals: Be in touch with your favorite stars. Access our Star Portal from your Mobitel phone. Charges: Rs. 4.00 per min + taxes. Streaming: You can view music videos and documentaries by making a video call to 555. Charges are Rs.3.00 per min + taxes. WAP Downloads: Get the world at your fingertips! Download the newest wallpapers, games, ringtones and animations on your mobile. Just go to wap.mobitel.lk on your Mobile and select from a wide array of downloads. Voice Stations: Brighten your day with Mobitel Voice station, a one-stop entertainment hub with exciting and popular music, fun games, jokes and drama. Choose from a number of categories, with each category offering huge collection of choices. Easy navigation and availability of different languages makes this portal the trendsetter in its segment. Mobitel Voice station promises nothing but top-class entertainment. Just dial 555 from your Mobitel. Call charges Rs. 1.00 per min + taxes.